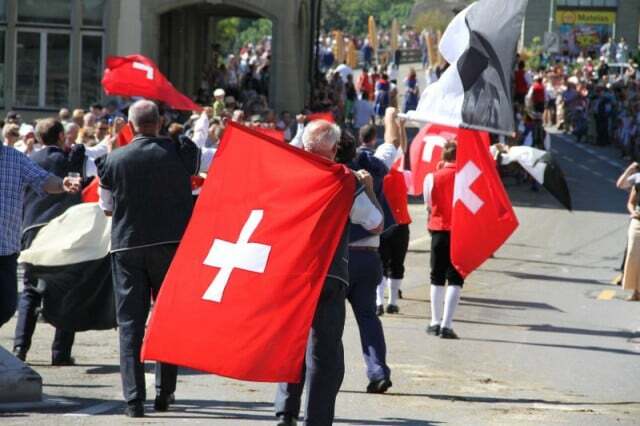 The annual La Désalpe des Quinquas Cortège of Fribourg (Freiburg) canton takes place early in September. The photos below are from the Cortège Exceptionnel of September 2011. La Désalpe des Quiquas parade in Fribourg is a large parade that coincides with the désalpe / Almabtrieb when cows return from the Alps at the end of summer to spend winter on lower meadows. Cows wear colorful head dress and farmers traditional costume. In addition to the cows, many villages and regions will show of local produce, colors, events, and traditions. Marching bands provide upbeat music. The Fribourg parade in 2011 included around 250 cows and 50 different groups of marchers consisting of around a thousand participants. Swiss stereotypes galore – decorated cows, cow bells, traditional dress, flag throwers, and teams of cleaners following every herd of cows.